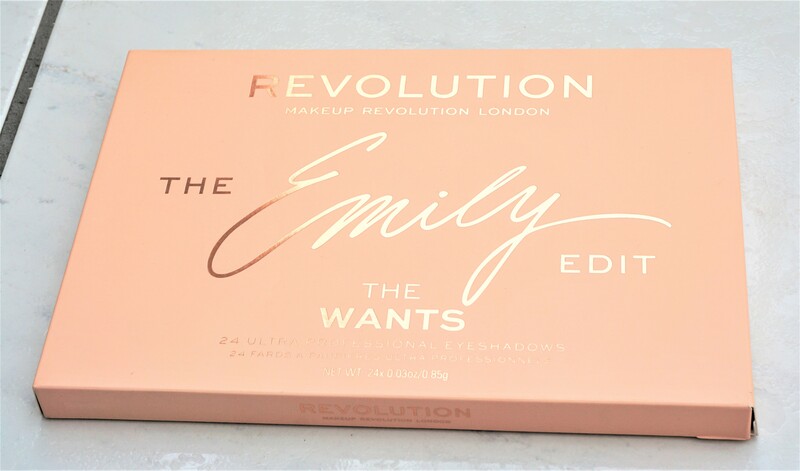 ‘The Needs’ contains Emily’s ‘greatest hits’ from her favourite Makeup Revolution palettes containing everyday essentials for face and eyes. ‘The Wants’ contains eyeshadows shades that have been created to inspire you, whilst also keeping you in your comfort zone. I really love the whole concept behind these palettes, as it is so true to the approach I take with my make-up. There are items which I feel are essentials and regulars in my collection. At the same time, I love playing with and experimenting with different shades of make-up. So the concept of ‘The Needs’ and ‘The Wants’ works well for me! The palette comes in a sleek, rectangular, peachy-beige box. 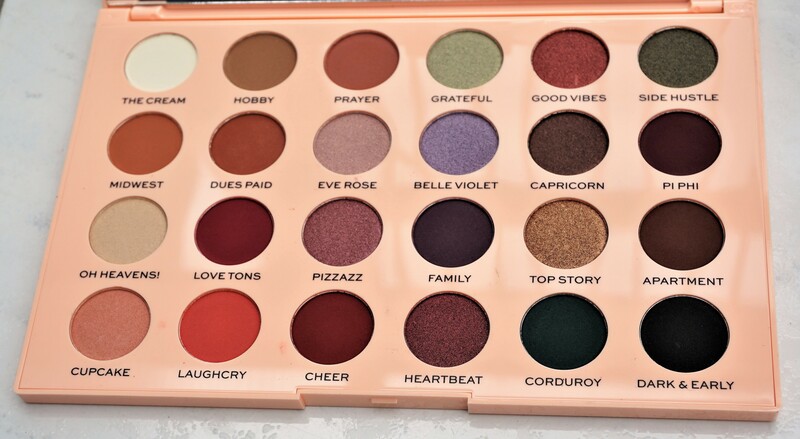 The palette is pretty big, as it contains 24 eyeshadows. The front of the box provides the brand, palette name and contents in shiny rose gold writing. Emily’s signature is printed on the front as part of the collaboration (The Emily Edit). The net weight of the products inside is also printed on the front of the box (24 eyeshadows x 0.03oz/0.85g). The back of the box has the brand name, palette name, a photo of Emily and her YouTube page details. The box also has a picture showing the products contained inside and the ingredients. ‘The Wants’ palette comes in a large peachy-beige rectangular casing, with the brand name and palette name inscribed in rose-gold writing. The back of the palette provides the brand name, palette name and net weight (same as above). The inside of the palette, like The Needs Palette, contains a large mirror which covers the whole of the inside top lid. The Wants Palette is huge in comparison to The Needs Palette (approx 9″x6″, compared to approx 7″x4″, respectively), meaning that you get an even bigger mirror for make-up application. 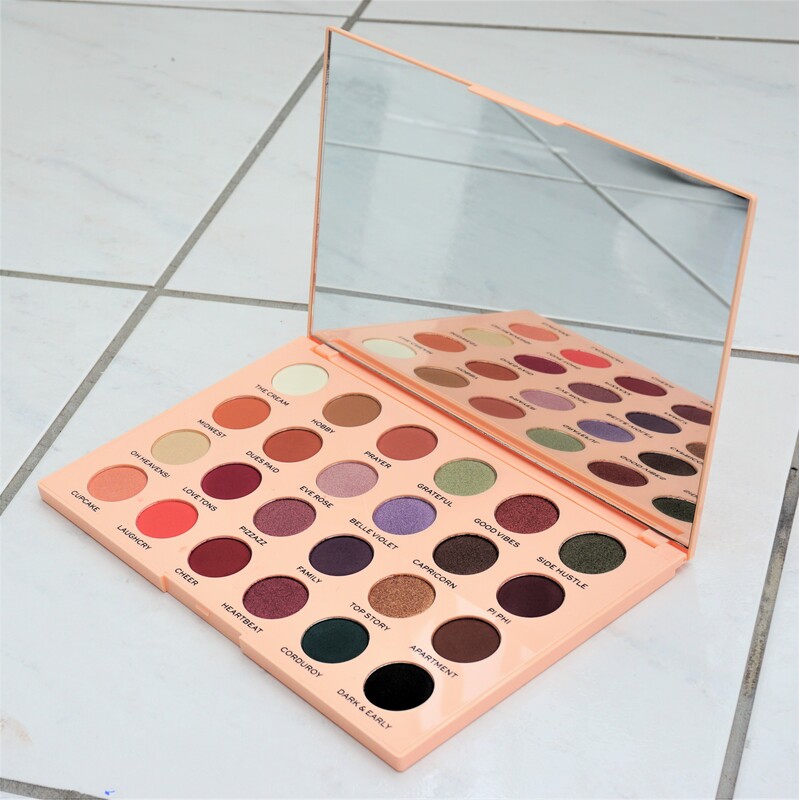 The bottom part of the palette contains the 24 eyeshadows, with four rows of six eyeshadows across the length of the palette. The shade names are printed underneath each eyeshadow. Emily gave information on the inspiration behind each shade name (you might understand some of them already if you watch her videos), which adds a really lovely personal touch to the palette. For example, shades ‘Eve Rose’ and ‘Belle Violet’ are named after her two daughters. ‘Top Story’ is inspired by her past job as a news anchor, whilst ‘Dark & Early’ comes from the time she usually records her videos. It is really nice using a palette and knowing that each shade and name has real meaning to the person who created it. The Wants Palette has a wide range of eyeshadow colours, from bold pops, deep and sultry tones, to beautiful neutrals. The colours include greens, golds, purples, plums, pinks, corals, browns, black, white and cream, with lighter and deeper tones across those colour spectrums. That’s a huge range of colours! I think the only colours missing from the palette are silvers and blues, which may or may not be a deal breaker for you. Often palettes are either more on the neutral or the colourful spectrum, so I really appreciate having both balanced out in the palette. The balance of colours means that you can go all out with colour, add in pops here and there or go neutral as you please. The palette contains a range of light, medium and dark tones, as well as different finishes (mattes, satins and shimmers). Having different tones and finishes enables you to use the eyeshadows for simple looks or combine them to create depth on the eyes. Another aspect I really love about the palette is that the tones span across colour spectrums. This means that you get light, medium and dark variations on particular colour families, as well as warm and cool tones. For example, there are three greens included – Grateful (light shimmery green), Side Hustle (shimmery khaki green) and Corduroy (deep matte green). Cooler purples like Belle Violet (a shimmery lavender) and Family, a deep matte purple are also balanced out by warmer purples, including Pizazz (a medium maroon purple and Pi Phi (a deep matte plum-purple). Palettes often just contain one of particular type of colour, so it is amazing to get variations within a colour family, as well as warm and cooler tones. Emily states that she designed the colours to be buildable so that people can achieve their desired level of intensity. I can see that with the shadows, as they have a beautiful pigment but are not overly bold. You can achieve a great depth of colour with one stroke or you can add an extra layer to really amp up a look. The shimmers have a beautiful sheen, without being metallic or too dramatic, whilst the satins have a subtle pearly glow. The mattes are smooth and show up on the lid with beautiful depth and intensity. The eyeshadows in general look the same shade on the lid as they appear in the palette. The only two exceptions are Belle Violet and Pizzazz, which show up on my lids a lot lighter and pinker compared to the pan colour. They look the same as in the pan when I swatch them on my inner arm (which is lighter than the rest of my skin is more tanned from summertime), just different on my lid. The shades may look different on me due to my skin tone or my undertones. Either way, they are still beautiful shades but it’s worth noting in case you love the look of those two particular shades and want to swatch them first. The eyeshadows have a good firmness to them but still have some ‘give’ when you dip into them. I like the texture, as they adhere well to the brush and the lid, without fallout on the face. You can also get the powder on to your brush easily, without having to swipe or dig in to the pans. The eyeshadows are really easy to blend and combine on the eye. The mattes blend effortlessly and can look more or less intense, depending on how much you build them up. The shimmers and satins blend beautifully too. I love this eyeshadow palette and would highly recommend it to anyone who loves experimenting with their make-up or wants to try out different colours. It’s amazing getting such a wide range of colours, tones and finishes all in the one place. The price point – £15 – also makes it a great option if you want to try lots of great quality eyeshadows at an affordable price. 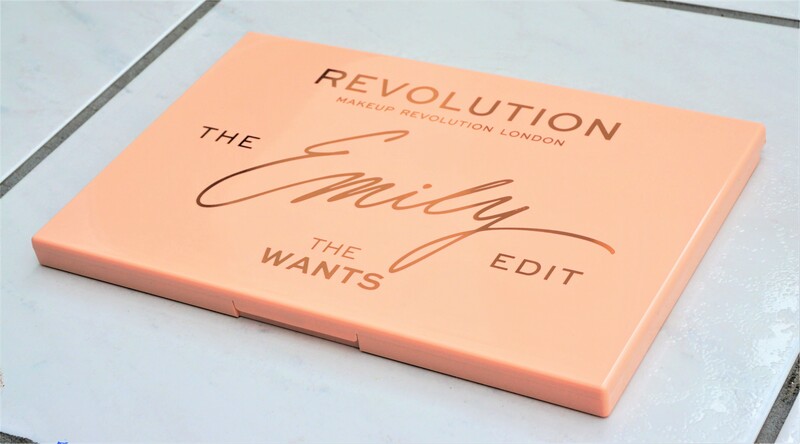 The Makeup Revolution: The Emily Edit ‘The Wants’ Palette costs £15 and is available in the UK from Superdrug and the Makeup Revolution website. 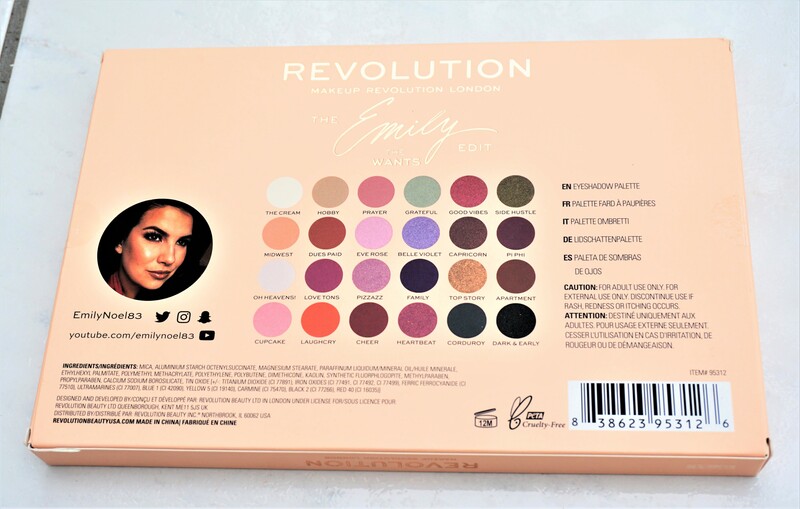 Have you purchased any of The Emily Edit Palettes? What do you think of them? Any fun combinations? Any other Makeup Revolution products you would recommend? Let me know your thoughts in the comment section below.